All throughout his life KQ disregarded the acts and directives of Syedna Mohammed Burhanuddin RA, however, Syedna Burhanuddin’s RA ‘amal mubarak during the janazah mubarakah of Syedna Taher Saifuddin RA is something he continually reminds us of. He wishes to point out the differences between the janazah mubarakah of Syedna Taher Saifuddin RA and Syedna Burhanuddin’s RA janazah mubarakah today. He fails to understand, however, that if he was the true mansoos, the greatest discrepancy between then and now would be the fact that he, the alleged Dai, did not even show up. 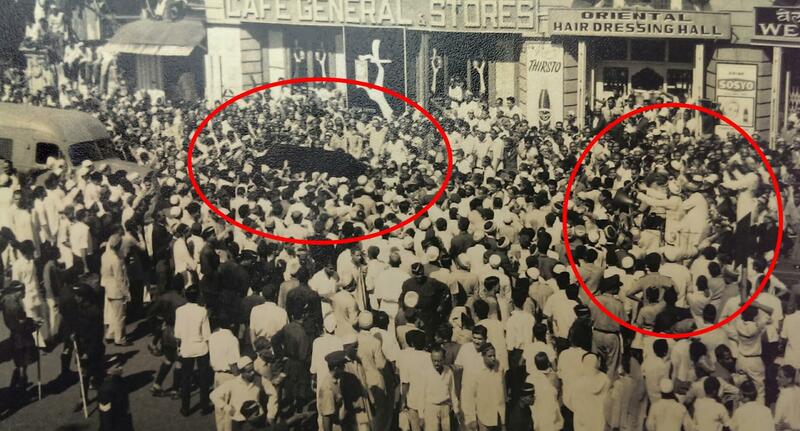 Further, many elders insist that Khuzaima was hard to find during Syedna Taher Saifuddin’s RA janazah mubarakah. His children insist that he was ‘occupied’ in making arrangements but in their narration of Burhanuddin Moula’s ‘amal mubarak and how Moula walked barefoot behind the janazah mubarakah, they are careful to never say that he walked as well. The truth is, he didn’t walk behind Syedna Taher Saifuddin’s janazah and Allah ensured that he would not gain the barakat of walking behind Syedna Burhanuddin’s, either. Community growth. There are today approximately 19,350 Mumineen households in Mumbai and its suburbs. With a very conservative average of four people per household, that puts the Dawoodi Bohra population of Mumbai today at roughly 77,400. Using the national Indian growth rate (which is generally less than the growth rate of Muslim communities in India), if we were to back calculate to 1965, the year of Syedna Taher Saifuddin’s RA wafaat, we could estimate the Dawoodi Bohra population of Mumbai at roughly 30,604. This does not take into consideration urban migration which has been huge on population growth in Indian metropolises, specifically in trading communities such as the Dawoodi Bohras. Calculating for urban migration would easily reduce this number by half to approximately 15,000. 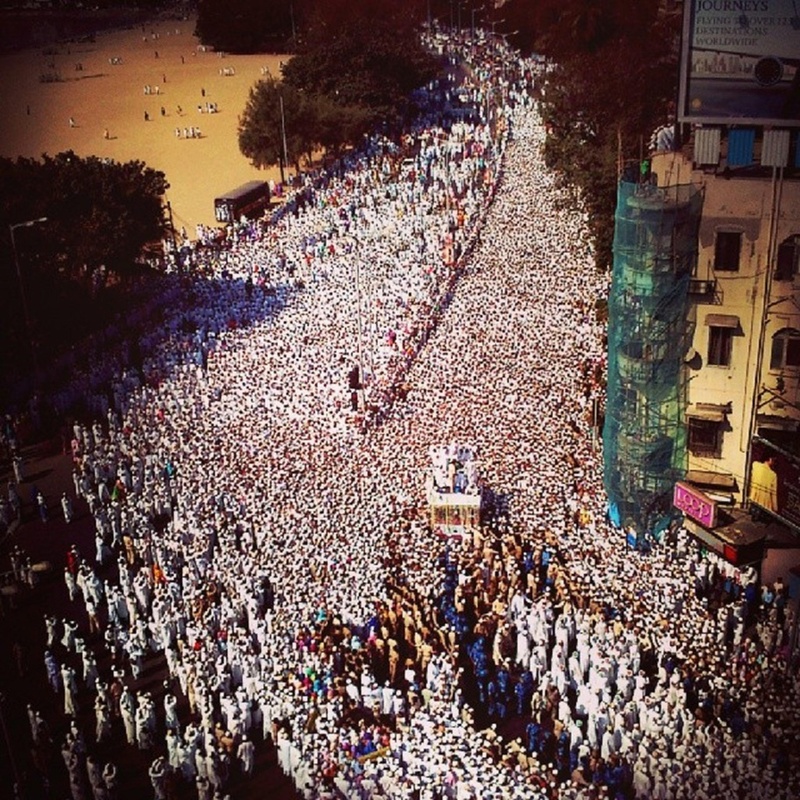 Simply put, the Dawoodi Bohra population of Mumbai today is exponentially larger than what it was half a century ago. This is one of the reasons why there were more people at Syedna Burhanuddin’s janazah mubarakah than his respected father’s. The world is smaller. News of Syedna Taher Saifuddin’s RA wafaat was announced on All India Radio the morning after he passed away. 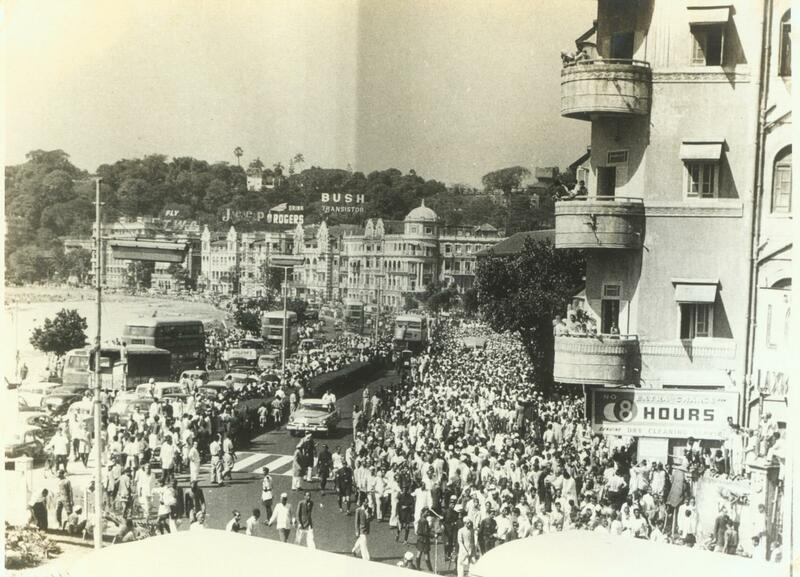 The jism mubarak was brought to Mumbai by train and car and the following day, after ghusl and takfeen, it was brought to Saifee Masjid whereafter it was laid to rest in Rawdat Taherah. The difficulties in transportation make it hard to imagine that more than a couple thousand Mumineen from outside of Mumbai would have arrived in time to participate in the janazah mubarakah. Word of Moula Burhanuddin’s RA wafaat was instantaneous. People from as far as London and Dar al-Salaam arrived in time to do deedar of Burhanuddin Moula RA at Saifee Mahal that very night. Thousands more arrived from international destinations in time for the janazah mubarakah which left the next morning. The highways leading into Mumbai from other Indian cities as night fell were packed with Mumineen vehicles. 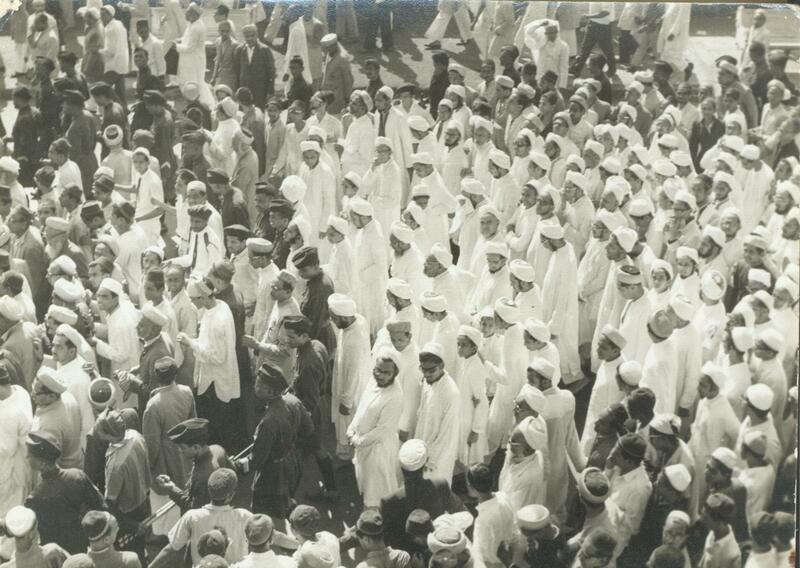 Train stations were full of Dawoodi Bohras. Literally, thousands upon thousands arrived to Mumbai by air, road and rail within 20 hours of Moula’s wafaat, in time to attend the janazah and namaaz. Flowering seeds of love. Syedna Mohammed Burhanuddin RA often stated in his wa’az mubaraks that he was reaping the seeds of love that his father had tirelessly sowed during his tenure as Dai. This statement indicates that the amount of love and devotion Mumineen had for Syedna Burhanuddin RA was greater than that which was for his father. Not only were the numbers of Mumineen greater, but the love and affection Mumineen had in their hearts, too, was greater. The images from the janazah mubarakahs of Syedna Taher Saifuddin RA and Syedna Mohammed Burhanuddin RA clearly illustrate these three points. However, instead of claiming that the janazahs were different, I would affirm that they were the same. Syedna Taher Saifuddin’s RA wafaat and its impact on the community was like no other Dai’s in the history of Dawat. In the same way, as anaa’ na saheb, sharing the glories of his father, the same can be said of Syedna Burhanuddin’sRA wafaat and janazah mubarakah: it was unprecedented and its impact on the community is unparalleled. Syedna Mufaddal Saifuddin TUS behind the janazah mubarakah of Syedna Burhanuddin RA near Chowpatty Beach. The seeds of love and devotion now in full bloom. In the face of these kinds of numbers, and this devotion, any course of action apart from what was chosen by Syedna Mufaddal Saifuddin TUSwould have resulted in harm of Mumineen and behurmati of the janazah mubarakah. This is besides the many other hikmats in his actions. There was no better, or more shari’at-preferred course of action than this. It does not take ilhaam or taaeed to understand this, just tawfeeq and mohabbat. That nothing else would suffice in this type of a crowd is obvious for those that were blessed to bear witness to this historic occasion. For those that were sitting at home uploading YouTube videos or searching for WordPress templates, that this is not obvious, that it cannot be understood, comprehended or seen, is of no wonder. Zoeb, Adna mumin, proudly KNOWING Syedna AALIQADAR Mufaddal Saifuddin[tus] is HAQ! 2. the world is smaller – I add – Yet KQ and his cronies sitting at Darus Saqifah hatching on their ill gotten wealth and “pigri” as Al Muqaddas Amirul Jamea Najmuddin Saheb declares in his nasihat could not make it for the Janazah Mubarakah a few kilometers away, AND WHY NOT? 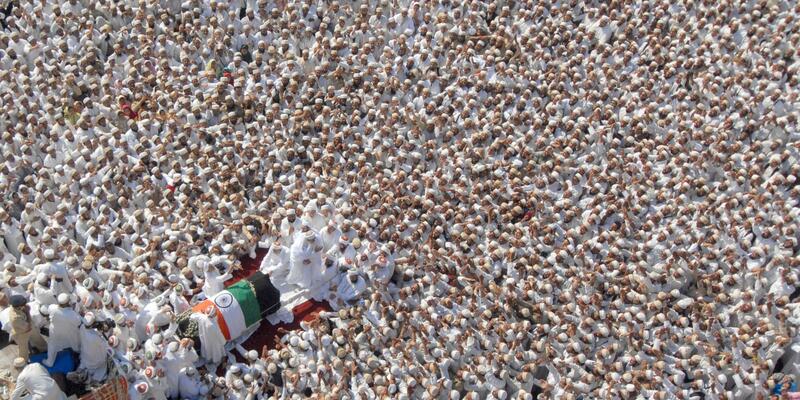 How can that kirafti come near such a paak mubarakah Janazah! Syedna mufaddal saifuddin (T.U.S.) is dai l mutlaq. What ever mola (T.U.S.) does is right . It is amal of shariyat. Haque is with mola (T.U.S.) and mola (T.U.S.) is with haque. Where was Daawedar for 3 years when Syedna Mohammed Burhanuddin Maula (RA) declared pubicly Nass on Syedna Mufaddal Saifuddin (TUS ). Was he sleeping? He is creating difference within the community and spoiling image of Dawoodi Bohra globally which Syedna Mohammed Burhanuddin was established over years. There were various occasions where both the Maula were seen together on takhat and in presence of Syedna Mohammed Burhanuddin Maula, Syedna Mufaddal Saifuddin was seen performing Waaz.